The third South Asian Federation of Accountants (SAFA) Quiz and Elocution Contest was organised amongst the students of SAFA member bodies on 22 January in Pune, India hosted by the Institute of Cost Accountants India with the objective to motivate students towards the focused study of financial reporting standards and to develop the future speakers for the profession. 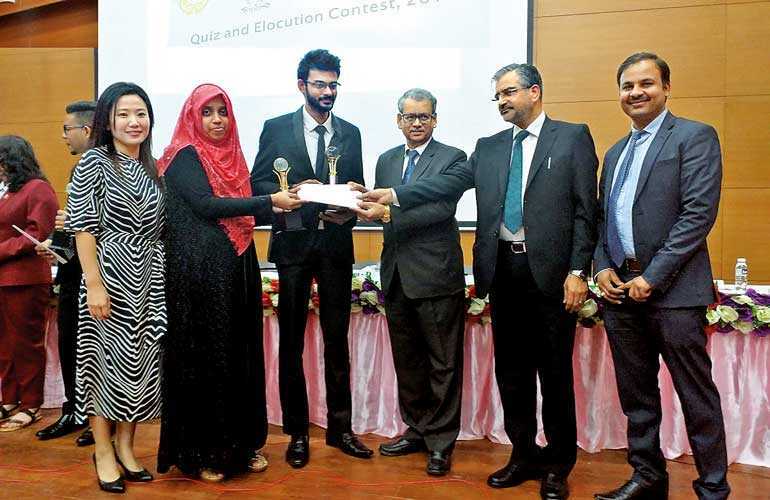 CMA Sri Lanka students Fathima Muneefa and Reshan Ponnamperuma bagged the first prize in the SAFA Quiz Contest based on IFRS 12, IFRS 13 and Arm’s Length Price and Transfer pricing, defeating SAFA Member Body students from Chartered and Management Accounting Bodies of SAFA. Muneefa and Ponnamperuma qualified after several preliminary contests at the CMA Sri Lanka Quiz and Elocution contest after rigorous training conducted by CMA Council Member Ruchira Perera and Consultant Trainer Dian Abeyewardene. The high quality of CMA Sri Lanka students brought honour to Sri Lanka at the contest among students of South Asian Accounting Bodies. The local competition was conducted under the leadership and guidance of CMA President Prof. Lakshman R. Watawala. At the SAFA board meeting, committee meetings and SAFA Elocution and Quiz Contest, Vice President H.M. Hennayake Bandara and Council Member Ruchira Perera represented CMA Sri Lanka.